Bills OL J.J. ‘Unga took a long and winding road to the NFL coming out of Division II Midwestern State. After being signed to Buffalo’s practice squad last season, he was eventually called up to the active roster and saw some limited playing time over the last month of the 2013 season. As his younger brother tries to embark on a pro career, he is squarely on the NFL’s radar. 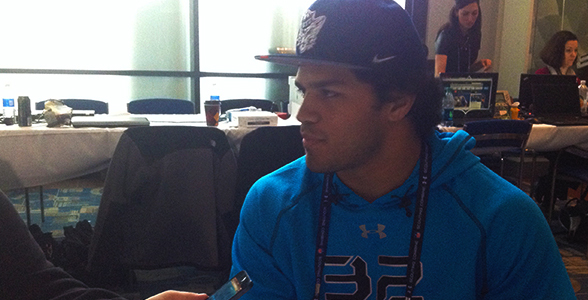 Uani ‘Unga, who also goes by Devin, is an inside linebacker out of BYU and he’s in Indianapolis at the NFL Combine. A tackling machine, ‘Unga got noticed due in part to all the NFL scouts who were busy watching fellow BYU LB Kyle Van Noy, who was a Butkus award finalist last year. After seeing the difficult road his older brother traveled to reach the NFL, he’s grateful for the invite to be here in Indy. Unga, who served a two-year mission, is a bit older than most college graduates considering he also had to redshirt a year after transferring from Oregon State. At 6’1″ and 233 pounds, ‘Unga is a bit undersized and may have to play in an under front to get some help inside as he might not be fleet footed enough to line up in a weak or open side position. He’s forecast as a day three pick or priority free agent and is expected to run in the 4.8s in the 40. Uani remembers when his older brother J.J. signed with Buffalo last season. It was big news on his family’s online page. Uani has a twin brother Feti, who played at Oregon State and finished school a year earlier than him due to Uani’s transfer year. He’s training for a shot in the NFL as well. Counting J.J. there are four other brothers all of whom are playing football. All but J.J. are playing collegiately. Uani now hopes to join his brother in the NFL ranks and envisions an opportunity to meet him at the second level on a run play some time next season. Rookie J.J. ‘Unga stands a good chance of getting his first NFL start at right guard today in place of an injured Kraig Urbik (foot), who will be a game time decision Sunday. He’s only been with the team for a few weeks, but he feels ready for the possibility of a full game’s worth of work. Being so new to the offense, ‘Unga has been working on just mastering the game plan week to week. He uses his spare time to absorb a few more pages of the team’s playbook. More importantly his teammates have faith that ‘Unga can get the job done. For those that may not have noticed, Bills new guard J.J. ‘Unga has an apostrophe at the front of his surname. Buffalobills.com asked ‘Unga about the apostrophe and how common it might be in the Tongan language. ‘Unga was born and raised in California, but both of his parents are native to Tonga. As for the apostrophe it’s common in the Tongan language. ‘Unga admits he grows tired of correcting people on the pronunciation. Most Americanize it and just say ‘Ung-gah.’ The lineman politely corrects most of the offenders often repeating it twice. The apostrophe is often viewed as a typo and simply ignored. Upon receiving his player jersey in Buffalo he noticed the apostrophe was missing from his name on the back. Buffalo’s most recent signee, OL J.J. Unga, was an offensive tackle by trade, but that’s not where he’ll line up for the Bills. “They had him at tackle, but we’re moving him inside to play guard,” said head coach Doug Marrone. Marrone explained the main reason they picked Unga up.